I’m happy to announce my next poetry reading will take place at Warsan and Xperience J’s Tomorrow’s Seduction: Kiss of Death Book Signing event. The event will be held: March 29, 2014 | 1PM-3PM | Annie’s Art Gallery | 5814 Allentown Way Camp Springs, Maryland 20748. 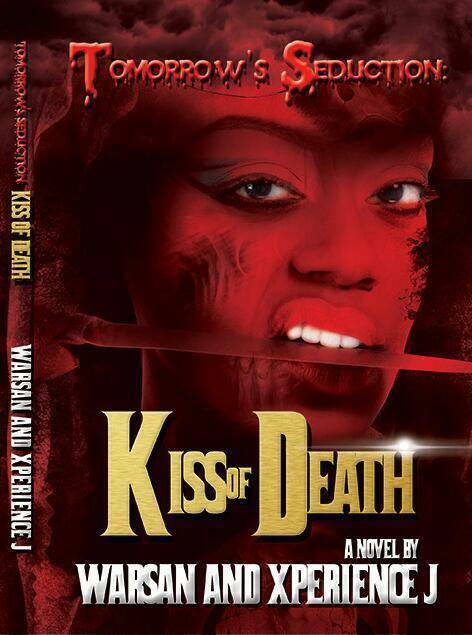 Fans can bring a copy of their recently published book Tomorrow’s Seduction: Kiss Of Death or purchase a copy at the event for $15. There will be music and poetry/entertainment. Light refreshments and mimosas will also be served. I agree with the authors that this will be a great opportunity to meet and connect with others in the community. So if you’re in the area on March 29, 2014, please come through! To RSVP for the event, please go to the Event page on Facebook: https://www.facebook.com/events/255511394623816/. To purchase a copy of the book in advance of the book signing on Amazon: http://www.amazon.com/Tomorrows-Seduction-Crystal-B-Judkins/dp/0615922880. This entry was posted in Book Signing, Community, Events, Poetry, Poetry Reading, Tomorrow's Seduction: Kiss of Death, Warsan and XPerience J by BuddahDesmond611. Bookmark the permalink.